Lionel Messi is the football version of Gaudi's cathedral, and unlike Barcelona's other monuments, we won't get the chance to visit the iconic No. 10 -- who turned 30 on Saturday -- for much longer. Lionel Messi might not be medicine, but he can feel like it. Watching Messi with a ball at his feet is a testament to the rest of our possibilities. Maybe we aren't so terrible, because he's one of us. He can make us seem better than we are. He rewards so many different kinds of attention. Sometimes he is best seen from a distance. If you're far enough away from the action so that the names and numbers have disappeared, Messi will still be easy to spot. That's him, way over there, the man farthest removed from the play. That's him standing by himself. Early in the game, he will also be the man who looks the most mentally distant, as though a spectator has invaded the pitch and nobody has bothered to chase him. He will be the one looking as though he's waiting for a bus, maybe with his hands on his hips, or with his hands running through his hair, or with his hands rubbing his eyes. He will be the only player doing more with his hands than his feet. In Barcelona's last La Liga game, at home against Eibar on May 21, there was a moment when Messi amazed by just how little he seemed to be doing. It was an important match -- a win coupled with a Real Madrid loss in Malaga would have given Barcelona the title -- and Eibar had taken an unexpected lead in the seventh minute. The cauldron that is the Camp Nou steamed with urgency, and when Eibar lined up to take a corner kick, there was a palpable sense of concern. Not from Messi. He was standing inside the center circle, watching the play but not really. Then he took a step and became distracted by something under his feet. The ground wasn't quite right. While Eibar took their corner, unsuccessfully it turned out, Messi was crouched down, his back to the play, doing a bit of work on the pitch. In that moment, at least, he didn't seem interested in healing anything but the grass. He was concerned with only the smallest of fixes. Maybe he knew that Cristiano Ronaldo already had put Real Madrid ahead in Malaga, and the fight was over. La Liga would not be his for the third time in nine seasons. Or maybe Messi was saving his resources for those moments when he knew he would make more of a difference. Or maybe he was watching Eibar and looking for weakness. Maybe he was Messi, lying in wait. Opportunities more worthy of his attention eventually came, but he failed to convert them. He missed from the top of the six-yard box, and Luis Suarez stared at him, open mouthed, the way a nonbeliever would contemplate a ghost. Later, trailing 2-1, Messi saw his penalty shot stopped. He tore into the front of his jersey with his teeth. That seemed to cleanse him, and he decided to play more like Messi, as though the choice had always been his. Now he was easy to spot for better reasons. Again and again he demonstrated the subtlest of his talents and so the most beautiful of them: perfectly weighted volleys and a nutmeg so grievous that it felt as though the victim had to be in on it. Barcelona tied the score, and then Messi converted his second chance from the penalty spot to give his side the lead, 3-2. Then he went on a run. With seconds remaining in the game, he picked up the ball inside the center circle, not far from the spot where he had made his earlier repair to the turf. Maybe he had known all along how important that patch of grass would be. He broke through two Eibar players immediately, and then he ran straight down the middle of the pitch, as though on a tightrope, making the slightest of feints to get past Alex Galvez, who almost blew a hamstring lunging for the empty space where he thought Messi would be. Messi dodged two more defenders, leaned inside, and slipped the ball across his body with his right foot, easing it into the bottom corner of the net, 4-2. In some ways it was just another goal for Messi, the 506th of his club career, made meaningless by Ronaldo's larger scheme which, this season, also happened to be the winning one. But for those of us lucky enough to see Messi's goal in the flesh, it would remain significant beyond reason. Even while Real celebrated their title in Malaga, Messi remained defiant, determined to write his own ending. That run was a message to his rivals in Madrid. It was also a message to sickness, to despair: This is what I can do. Who cares about you? On Saturday, Messi will turn 30. He made his professional debut in October 2004, when he was 17 years, 3 months and 22 days old, the second-youngest player to dress for Barcelona's senior side. Somehow, that was almost 13 years ago. There are teenagers who know life only with Messi in it. The math is easy, except that it isn't. Messi will not be playing football when he is 43. His career is more than half over. It is probably three-quarters gone. Whatever the number of games that remain for him to play, and so for us to watch, it will be far less than he, and we, have already enjoyed. It is almost painful to see film of him from the start of things. He played differently then. He was unblinking, like a child. His skin was clear of tattoos. His hair was boyishly long, parted in the middle. Now we know the greatness that awaited him, but back then, when he came sprinting off the bench for the last eight minutes against Espanyol, the first eight minutes of his career, he was all future. Today's Messi is mostly past. Each time we see him, we get a little bit closer to what will be our last chance. There are other reasons for urgency. Barcelona seem on the verge of a downswing, or at least their version of one. Real Madrid, the champions of Spain and of Europe, look ascendant, barring Ronaldo's possible tax exile and despite Messi's memorable last-minute strike in April's El Clasico. (Has there ever been a better celebration than his lifting his jersey to the Bernabeu crowd?) There also have been fissures of discontent among Barcelona's collection of stars, with reports surfacing in the Spanish press, first at Diario Gol, that Neymar's father wants him to leave to escape Messi's shadow. Ernesto Valverde, the club's new manager, has yet to oversee a game, and Messi's own contract extension talks have been protracted, still incomplete. The Spanish radio station Cadena Ser reported earlier this month that the terms of Messi's extension -- three more years, with a possible fourth, and a £348 million buyout clause -- have been settled. But the contract has not been officially announced or signed. Messi had rejected Barcelona's opening offer, worth about £29 million a season, and there were worried rumors that he might end up leaving the club for somewhere like Manchester City. That seems unlikely. City CEO Ferran Soriano recently said that he expected Messi would retire at the only club he has known. Messi and Barcelona, the city and the side, have become almost impossibly intertwined. Earlier this month he bought a hotel down the coast; his fiancee and Suarez's wife partnered on an upscale shoe store in town in the spring. In May, club president Josep Maria Bartomeu said: "There are no doubts. The marriage between Messi and Barcelona will continue." Marriage, with all its love and resentments, with its daytime certainty and slivers of late-night doubt, is the right word. The prospects are far dimmer for his international career, despite his successful appeal of his four-game suspension for swearing at a linesman. Argentina are in a state of disarray on and off the pitch. Messi famously retired following yet another second-place finish in last year's Copa America, only to change his mind. His side currently sit fifth in CONMEBOL qualifying, a point outside a guaranteed place in next year's World Cup. It will be a shock if Argentina don't make it to Russia, but it's shock enough that it's even a possibility. Messi's career is evidence of the fineness of lines even for the best of us. It's all such a delicate balance. Were it not for a course of growth hormone when he was a child, we might never have caught a single glimpse of the tiny, talented boy from Argentina. If it weren't for a long, low shot that he delivered just wide against Germany, he might have won the 2014 World Cup. If it weren't for his missed penalty, he might have won last year's Copa America, too. 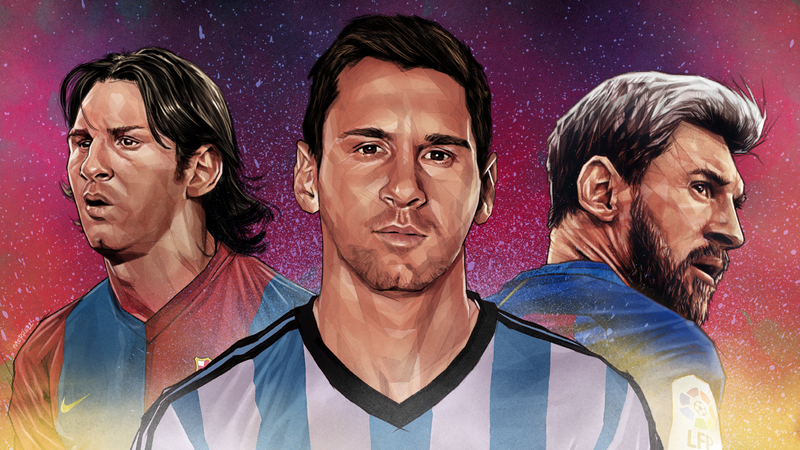 Messi's most masterful illusion is his appearance to be in total control of his fate, his legend long secure. An entire theme park devoted to him and his exploits is scheduled to open in Nanjing, China, in 2019, which says something about both his global appeal and the fantasies he inspires. The museum at the Camp Nou already has a section reserved for him, Ballon D'Or after Ballon D'Or in glass cases made cloudy by the fingerprints of the faithful. They visit the museum in their legions from around the world, more than 1.6 million annually. There is a feeling, walking with the crowds of foreign visitors to the stadium, holding aloft scarfs still creased, that he has become one of the city's principal tourist attractions: Gaudi's Sagrada Familia, the Gothic Quarter, and Lionel Messi. He can be confused for a monument. But a man is nothing so permanent. Messi knows this. In a rare interview with ESPN's Jeremy Schaap in 2014, Messi was asked why he seems to pay so little mind to how history will view him. "Because the only thing that matters is playing," he said. "I have enjoyed it since I was a little boy, and I still try to do that every time I go out on to a pitch. I always say that when I no longer enjoy it, or it's no longer fun to play, then I won't do it anymore. I do it because I love it, and that's all I care about." More and more, he has been given reason not to love it. If he does sign a three- or four-year contract, that will probably be his last. The joy will be wrung out of him by the end of it. Our expectations of him are so high, the greatest player in the world is somehow also becoming the most underappreciated one. He scored 54 goals in 52 games for Barcelona this season, and it's still a disappointment. He finished second in the World Cup and second in the Copa America, twice, and he has let his country down. His gifts are so great, his miracles so routine, that they can exceed our capacity to appreciate them. He lifts us, but he also exposes the limits of our attention, the ceiling for our mindfulness. He has given us so much to remember, we're already starting to forget. On May 27, Messi played the final game of his third decade, the Copa del Rey final against Alaves in Madrid. There was a strange, almost sinister atmosphere at the doomed Calderon from the start. Ronaldo and the rest of Real were preparing to play Juventus in the Champions League final, and it was clear that the Spanish capital's attention was elsewhere. There was also an unhappy sense that Barcelona's season was a failure regardless of the result. The underdog's end was full to bursting, but there were hundreds and perhaps thousands of empty seats in Barcelona's half of the stadium. Club flags had been placed on every chair in advance, and many of them would stay there, draped over the backs of vacant seats. Even Messi looked out of sorts, rubbing the back of his neck as though he had a headache that he couldn't shake. He walked to his position, his eyes down. He took in nothing but his feet. In the third minute, he touched the ball for the first time, stopping a hard pass with his chest. The ball dropped obediently to his feet. He turned and lifted a long, pinpoint pass deep into Alaves territory. It was, by his standards, a totally unremarkable play. It was also, by the standards of the rest of us, six seconds of grace. Messi can seem obscenely blessed. He might run less than anybody else on the pitch, but it is uncanny how often he is in the right place. There were countless times against Alaves when he looked to be out of position and the ball still ended up trapped in his orbit, as though he generates his own gravity. Watching him closely -- not from distance this time, but under a microscope -- it's possible to anticipate when he will receive the ball, because he still lights up like a boy when he senses its arrival, an almost imperceptible surge of energy coursing through him, a current that pushes him to the balls of his feet. He can do what every great athlete can do and the rest of us can't: He can see the future. He knows what will happen before anyone else in the stadium understands what just did. Messi opened the scoring that night, launching a low curling shot from outside the box, and he began running in celebration before it had even found the net, 507 and counting. Later, he fed Neymar for a second Barcelona marker, and then, in stoppage time, just as he had against Eibar, he went on another run. This time he received the ball near the sideline, near his bench. He broke out through two defenders and cut across the top of the box. He looked as though he might shoot, crafting a near-perfect replica of his wonder goal against Bilbao in 2015. Remember that one? Could Ronaldo have done that? The debate over their respective greatness will rage, because it's unsolvable. It's like arguing whether you prefer gold's flash to silver's charm. It's up to you. Ronaldo's fans will point at his athleticism, his scoring touch, his nose for goal and his Euro 2016 trophy. Messi's will cite something less explosive but perhaps more complex, such as that run in the Copa del Rey final against Alaves. It didn't end with a shot after all, but with a sublime pass to Paco Alcacer, who easily slotted the ball home to make the final score 3-1. Messi didn't just pass that ball. That's like saying Einstein did some math. It took several looks at a replay to determine what exactly Messi did do. He employed his limitless imagination and a delicate heel to slip the ball through three converging Alaves defenders who nearly lost their boots. He had pulled one of his impossible tricks almost in spite of all those empty seats, a little dig to remind the distracted what they will one day so deeply miss. The thrill of magic comes when your heart wants to believe in something that you know can't be real. The thrill of Messi is different. He makes your heart question the reality of something that you know you just saw. A few minutes and forever later, Messi stood on a podium that had been set up in the middle of the field, celebrating his win with his teammates. Fireworks went off when he held up another trophy. Soon it will join the rows of them behind glass in the Camp Nou museum, one more spoil of an endless war. He found his fiancee and his children and brought them onto the pitch, where he played with his kids on the grass. Then he returned his family to the spectator side of the ropes, and he walked, the way he always walks, back to the podium, now empty. He sat down and pulled his legs close to himself. The stadium lights started going out. These were some of his last public moments as a young man, the start of his inevitable slipping away. He enjoyed them not alone, but he was almost alone, and not invisible, but he was almost invisible. He pulled down his socks and removed his shin pads, shining with sweat. He rested, and he savored, and he soaked. More lights went out, and finally he lifted himself back to his tired feet. He walked just a little more, this time toward the sideline. The few remaining fans reached out to him from the stands in worship. He smiled and waved to them, took a few steps down toward the tunnel, and disappeared. Chris Jones is a writer for ESPN FC. Twitter: @EnswellJones.